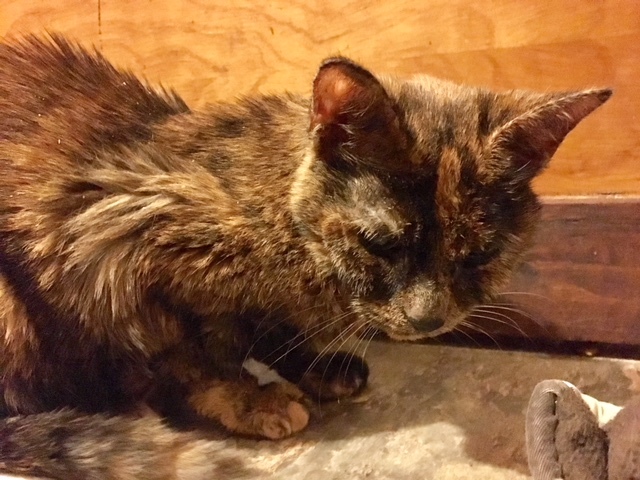 In late October of this year, I posted “Losing Peanut Butter: Is My Senior Cat Dying?” In it, I talked about my fear that our elderly (18 years!) tortoiseshell cat was dying. She was weak, had lost a lot of weight and had recently gone blind due to complications of high blood pressure. She rallied in early November. She had gained almost a pound (that’s a lot when you only weight six pounds), was maneuvering around the house well and seemed to be adjusting well to her recent blindness. We were cautiously optimistic that perhaps it wasn’t time for Peanut Butter (aka Miss Thang, Miss B*tchy Pants, Newman, etc.) to leave us yet. But every up has a down. We now keep a litter box on every floor of the house as well as fresh food and water, because Miss Thang seems to have lost a lot of energy and is increasingly less inclined to stray too far from any of us. At that point, it was back to the veterinarian’s office. They couldn’t find anything new wrong with her. The vet told us that sometimes senior cats just get old and “wear out.” He suggested that we monitor her closely for any signs of organ failure or disorientation. Last week, Peanut Butter stopped using her litter box. She would get close to one, but never made it into one, so we have to clean up after her. It seems like her circle of movement has narrowed to one area of the house and she’s staying in it. For a senior cat she still eats well, but she is either not peeing much or she has found a place to pee that we don’t know about. She looks miserable, from her flaky, dry skin to her gaunt frame. We have a call in to the veterinarian and are waiting for a call back. We fear that this is the beginning of kidney failure, which means we’ll have to make a gut-wrenching decision. I’m devastated by the thought that our old Tortie may not have another Christmas with us. We hung stockings a few days ago and I had an awful moment when I thought that hanging up her stocking might somehow jinx her, bringing her death faster because we were somehow tempting fate by assuming she’ll be here on Christmas morning. Just thinking about losing Peanut Butter brings tears to my eyes (and occasionally triggers a full-blown panic attack). Our dog Soldier will be devastated; they’ve spent the last 15 years side-by-side. I don’t want to have to arrange for euthanasia, but I may have to. She no longer seems to enjoy anything (she’s stopped playing altogether) and sometimes she simply sits in the middle of the room and makes plaintive, mewling sounds. Why does it seem like the possibility of having to make this decision has been suddenly thrust on me? We’ve been watching her slow decline for months, but I still feel blind-sided. And every time our senior cat rallies a bit, the emotional roller coaster takes me for another breathless and tear-stained ride. My husband assures me that we will know when it is time to make that final drive to the veterinarian’s office. I’m not so sure. I’m hoping she will pass quietly in her sleep, snuggled next to her buddy Soldier. But I do know that when and if we decide to help Peanut Butter cross the Rainbow Bridge, our senior cat will do so cradled in our arms.